Dave Broom lands at the largest, maddest, geekiest, most hedonistic event in the bar trade’s year - Tales of the Cocktail. Stepping out of the terminal at Louis Armstrong Airport In New Orleans (NOLA from now on) is like plunging into a warm shower. It’s as hot as it was when I left Houston – about 100˚F (as the Americans say), but infinitely more steamy. The result is that, while it is like a warm shower, you need to have a shower to stop you feeling as if you have just been in the shower. If you get my drift. Anyhoo… that’s life in NOLA. Things will only get worse. Or better. Or both. Probably at the same time. This is, after all, Tales of the Cocktail week, the largest, maddest, geekiest, most hedonistic event in the bar trade’s year. A leisurely bus ride later, a dumping of the bag in the hotel and my partner in crime Ryan Chetiyawardana and I head into the French Quarter for our first gig. Tales officially starts tomorrow (Weds) so the streets are remarkably quiet – well, apart from a procession of delegates from a different conference marching down the street after a brass band. They look a relatively sober bunch (sobriety being a relative term in this city). This is not a bad thing. Four years ago Tales coincided with a swingers convention. I’ll leave it at that. We’re heading up Royal Street to Beam Suntory’s Julep House, though such is the humidity and subsequent loss of liquid that it is soon clear that we need to hydrate. Mr B’s Bistro seems appropriate for a swift(ish) Scotch & soda which will tide us over before we reach the gig. Ryan and I are doing a class on peat and smoke in drinks on Wednesday to about 220 people and using (with their permission) a selection of smoky drams from the Beam Suntory stable - Hakushu, Connemara, Ardmore, Bowmore and two from Laphroaig including this year’s Cairdeas. Ryan, for reasons best known to himself, has brought along a sample of the last, labelled as 'tea syrup' to disguise its true function. He’s also put it in a plastic bag which makes it look like, well, a sample. If you get my drift. I think he’s being generous just in case they don’t have enough in the house. He’s like that. It still looks weird though. The Beam Suntory guys can’t make the class because they’re working in the Julep House, so after snaffling a significant chunk of their dinner (first jambalaya of the trip), we sit on a piano stool in the faded elegance of the house’s front room and take them on a quick run-through of the talk: what is peat, how is it formed, how does it get into whisky, how do distillers control it, what does it give to distillery character, how it manifests itself on the palate, why Islay peat is different to mainland and Welsh, how it has terroir, how to use it in drinks. The stars of the show are Bowmore 15 – which is just astounding at the moment – and the Cairdeas which is all hot roads and seaweed, clove, bog myrtle, herbs, mint and horse stable. 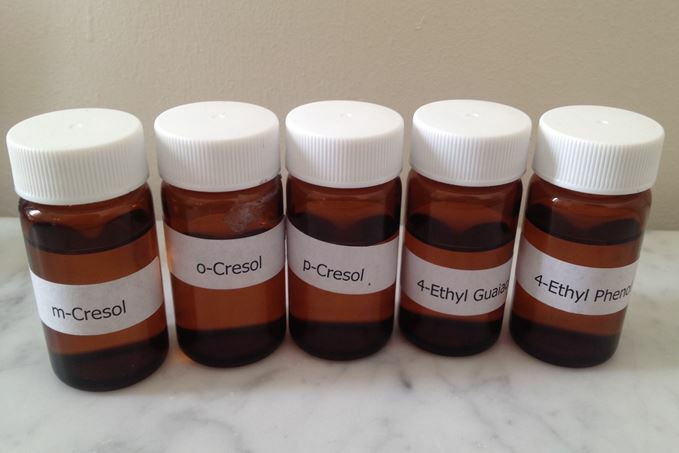 I come away clutching five bottles of different phenols. I sniff one of them – there’s the horsey note. Ryan still is clutching his sack of Cairdeas. Unopened. They had enough. It seems to have become like a comfort blanket for him, but looks increasingly like some medical procedure has taken place. Early night all round. Need to be fresh for the first day proper. Ryan has to start prepping his drinks early. I have to write this and sniff some phenols. This is work, after all.